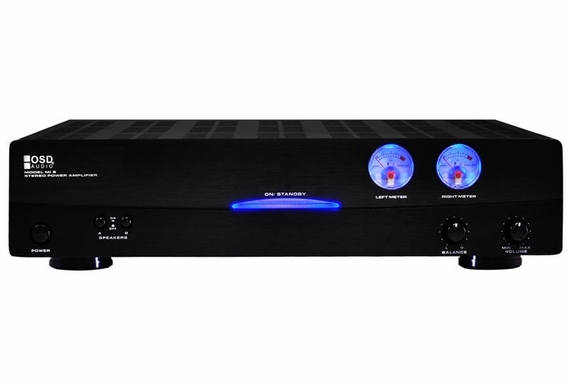 A team OSD favorite, the AMP200 is a high current 2-channel amp with loads of features. This amp lets you home run (directly to the back of the amp) two pairs of speakers or 4 speakers total. Since it's high current, you can add up to 4 pairs of speakers (8 speakers total) by adding OSD speakers selectors such as the DSM4. Rated at 80 Watts per channel at 8 ohms, the OSD-AMP200 is overload stable so it’s ideal for use anywhere clean power is needed. It also includes a dual source switching circuit. When you connect two independent sources number (say your iPod and a TV in another room) source one takes priority when it is active. When source one is turned off, source number two comes on. Note: You cannot play two sources simultaneously. For this feature you need a multi-channel amp like our MX1260. Step-up features rarely seen in amps of this price range include a built-in voltage meter, and front mounted volume and balance trim controls. Can the AMP200 be used with the RSUB300 outdoor rock subwoofer? Will it turn on or off automatically when reciever is turned on or do you have to turn it on independently. Hi Rich, This amp does have an auto-detect feature that you can enable. It will go to sleep when it senses no input, and it will awake when it senses the input. Hi Rich, You can connect a receiver via RCA cable to the Line 1 or Line 2 input on the AMP200.